Tohti, a former professor at the Central University for Nationalities in Beijing, was sentenced to life in prison following his conviction on a charge of “separatism” by the Urumqi Intermediate People’s Court in Xinjiang on Sept. 23, 2014. “The ethnic group that he represents has been enslaved, suppressed, and excluded, which has resulted in a lot of hate and violence,” he said. “This will put a huge amount of pressure on the Chinese government,” he said. “Ilham Tohti was handed a harsh prison sentence for his advocacy of mutual understanding, tolerance, and dialogue between the Uyghurs and the Han Chinese,” Raxit told RFA. “That’s why 43 MEPs entered his name as the last of the nominees to make the shortlist,” he said. “This shows that the European Union and the international community have recognized the direct connection between violent incidents in Uyghur lands … and the discriminatory and aggressive policies implemented by the Chinese government,” Raxit said. Speaking to RFA’s Uyghur Service following the announcement, Ilham Tohti Initiative members Enwer Jan and Marie Holzman welcomed the Parliament’s decision, saying the nomination shines a light on the Uyghur people’s suffering under Chinese rule. 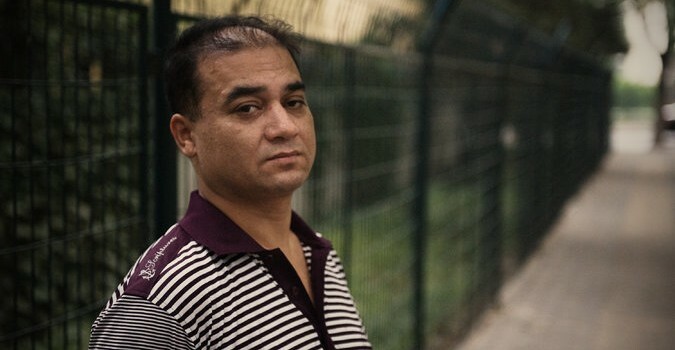 “Although he is now in jail, I congratulate Ilham Tohti on his nomination,” Jan, a Uyghur activist, said. “What makes us happy is that, because of Ilham Tohti’s nomination for this prize, the members of the European Parliament have begun to promote an understanding of who Ilham Tohti is, what he did, and who the Uyghurs are,” she said. Associate professor Elliot Sperling of Bloomington University’s department of Central Eurasian Studies said Ilham Tohti’s nomination recognized that he had been made a “scapegoat” by the Chinese government for tensions in the troubled northwestern region of Xinjiang. Amid a growing climate of arrests and “disappearances” in the wake of violent unrest in the Xinjiang capital Urumqi in 2009, Ilham Tohti had planned to spend time as a visiting scholar in Sperling’s department at Bloomington, Indiana.